PES-Architects is one of the leading architectural design firms in Finland. Their innovative, sustainable and ambitious projects in Finland and China include transport, culture and commercial buildings. From airport terminals to opera houses and skyscrapers, the firm’s determination continually takes them to new heights. Founded in 1968, PES-Architects’ continued success for the past 50 years is evident. This spring, the company held an exhibition at the Museum of Finnish Architecture to mark the occasion. Their repertoire is extensive: from complex public buildings such as theatres, airport and railway terminals to sport facilities, retail developments and office buildings. In addition to all of this, the company also specialise in interior design and urban planning, as well as refurbishment projects. Operating mainly in Finland and China, the company have also carried out projects in the Gulf Region, Germany and in Russia. “Part of our strength lies in our diverse and international design team of 70 employees, representing over ten different nationalities,” says Tuomas Silvennoinen, partner and chief architect at PES-Architects. One of PES-Architects’ specialities is designing cultural buildings, including a number of theatres and opera houses in China. “We’ve been working in China since 2003, and opened our Shanghai office in 2010. In the last 15 years, we have extended our operations there significantly, due to the endless potential, especially for cultural and commercial buildings,” Silvennoinen says. In addition to these, the firm’s notable building designs in China include the sculptural Icon YunDuan tower in Chengdu, the ambitious Wuxi Grand Theatre, and the Fuzhou Strait Culture and Art Centre, located in Mawei New Town, by the Minjiang River. The building, designed by professor Pekka Salminen, founder of PES-Architects, is shaped in the form of the petals of a jasmine blossom, the city flower of Fuzhou, and includes an opera house, concert hall, multi-functional theatre, art exhibition hall, as well as a cinema centre. “It connects cities and communities along and over the Taiwan Strait. 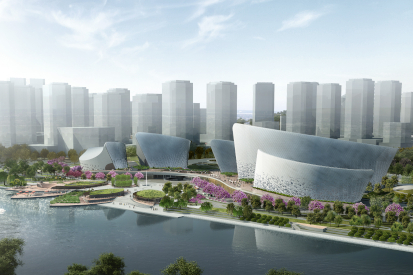 It also connects the Fuzhou New City Development and its waterways to the Minjiang River and the natural environment. And, finally, it connects people to culture. People are always the focal point in everything we do,” Silvennoinen states. The culture centre will open its doors in October 2018. As well as cultural and commercial buildings, PES-Architects specialise in transport buildings, such as airport and railway terminals. Their most high-profile transport project is the Helsinki-Vantaa airport, where the firm have been responsible for a significant amount of the construction, as well as the design for over 25 years. Helsinki-Vantaa airport has consistently been ranked among the world’s best airports, and recently, PES-Architects firm has been working on the airport’s terminal expansion, set to be completed in 2020. “We must be able to cater to the first-time visitor, as well as the seasoned traveller. First and foremost, the space must serve its users well. We pride ourselves on offering functional, durable designs, that also provide a positive experience for the people that these designs are there to serve. Our buildings need to make people feel excited, and it is our duty to make their experience uplifting and inspiring; that is the true purpose of architecture. Mere rationality is not enough: you need to add an emotional layer to all architecture too – a form of rational poetry at its best,” Silvennoinen explains. Other recent transport designs include the new passenger terminal in Helsinki’s West Harbour, completed in February 2017. “The main aim was to provide optimised conditions for the ferry traffic between Helsinki and Tallinn, ensuring smooth, comfortable and fast traffic operations. Despite the focus on efficiency, the design is also focused around providing a high standard of quality and comfort. The public spaces are bright, comfortable and feel safe. The surface materials were chosen for wear-resistance so the building will retain its attractiveness throughout its life cycle,” Silvennoinen says. The terminal has received several awards both in Finland and abroad, including a prize for steel construction of the year in Finland in 2017. At the heart of PES-Architect’s ethos are sustainable and durable designs. “We always aim to focus on ensuring the highest ecological, economical and architectural quality is maintained throughout our design solutions. We are constantly expanding our cooperative network of specialists in various sustainability and energy-saving engineering fields. There is an increasing demand for ecological solutions in consumer goods, and we believe the same should apply to architecture. We consider each project individually, to suit each client’s specific needs. Our multi-skilled team has a strong vision and endless talent, and we are able to provide cross-disciplinary and creative solutions to our clients,” Silvennoinen concludes.